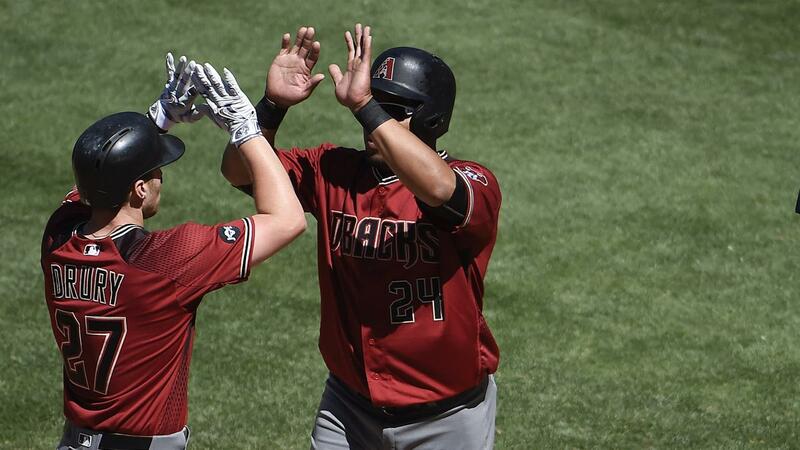 Yasmany Tomas hit a pair of homers -- the first multi-homer game of his career -- and drove in three runs to help lead the D-backs past the Padres, 7-3, on Sunday afternoon at Petco Park. The D-backs took two of three games in the series. Tomas' two-run homer in the first gave the D-backs an early lead while Brandon Drury's two-run shot in the fourth put them ahead, 4-3. Tomas' second homer came in the sixth as part of a two-run rally that also included a triple by Drury. The offense backed Patrick Corbin, who allowed one earned run over 6 2/3 innings for the win. "I feel really happy because this is the first series we won this year," Tomas said through an interpreter. "So it was important for me to do that because it was good for the team not just for me." The Padres took advantage of a sloppy two-error inning by the D-backs in the first to score a pair of runs and briefly took a 3-2 lead in the third on Melvin Upton Jr.'s RBI triple. Bullpen saver: The D-backs made a pair of roster moves prior to the game to bolster their weary bullpen and Corbin helped matters by giving them 6 2/3 innings. The left-hander has been the team's most consistent starter so far this year and delivered much-needed innings Sunday. "Again, Patrick Corbin goes out there and gives us much-needed innings," D-backs manager Chip Hale said. "He just looked great." Bunt and a blunder: The Padres tied the game, 2-2, in the first when Cory Spangenbergbunted to the right of the mound with Wil Myers on first via a single. Corbin fielded it cleanly, but paused on his throw to Drury covering first. Corbin's toss was erratic, allowing Myers to score and Spangenberg to reach third. Showing signs: After a slow start to the year, Tomas has begun hitting the ball harder the past two days. Tomas entered Saturday's game with a .185 average and collected three hits a couple of which were well struck. Sunday he was 3-for-4 with a pair of homers and he gave the lineup a boost with regulars Paul Goldschmidt and David Peralta on the bench. Swing and miss: The Padres had one last gasp to make it a game in the seventh, with Spangenberg representing the tying run with two on and two outs. But Spangenberg, who's been scuffling, waved at a Andrew Chafin pitch low and away to strike out and end the threat. The home run by Tomas in the first inning was the 3,000th in D-backs history. The franchise's first homer was hit by Travis Lee on March 31, 1998. The D-backs won a manager's challenge in the third inning when, with two outs, Rickie Weeks Jr. was ruled out while stealing second base. The call was overturned, which prolonged the inning, but Phil Gosselin couldn't make it hurt, as he flied out to end the inning. The Padres prevailed when questioning the back end of a double play call in the fourth. Chris Owens was erased on the front end off Spangenberg's relay to Alexei Ramirez. His throw to Myers was originally ruled late in trying to erase Owings. But the call was overturned. D-backs: Archie Bradley makes his 2016 debut as the D-backs open a four-game series with the Giants on Monday night at 7:15 p.m. MST at AT&T Park. It will be the final stop on a three-city, 10-game road trip and is the seventh game of a 20 games in 20 days stretch for Arizona..
Padres: San Diego gets a Monday off before welcoming the Pirates to Petco Park on Tuesday for a three-game series. Colin Rea (0-1, 5.56) makes his third start of the year and debut at home with the first pitch at 7:10 p.m. PST.